In August of 08', Ellen DeGeneres & Portia de Rossi were married during, as Portia describes, "the most beautiful and emotional day… one that we'll never forget." The happy couple exchanged their vows in front of their closest family and friends at their home in L.A. The reception dinner, made by their personal chef, was completely vegan and even included a vegan red velvet wedding cake by Sweet Lady Jane . Both brides look so happy and stunning in this picture, and Portia’s gown is simply gorgeous! Hmm, I wonder how that cake tasted. Vegan cuisine is becoming bigger and more available within the event planning industry. Which is fantastic, considering the ever-growing vegan population and those who have special dietary needs. Click here for a vegan red velvet cupcake recipe to try at home. A marriage like this is the perfect opportunity for me to talk about the vast array of events that are, and can be, included in my portfolio. 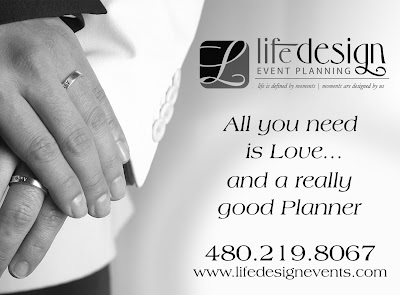 Life Design Event Planning is here to make any kind love story into a wedding day reality. I am a proud member of the Greater Phoenix Gay & Lesbian Chamber of Commerce, and my team and I am honored and excited to represent any & all communities.